Welcome to Bodrum Garden Cottage, situated a mere 250 metres from the clean clear waters of Bitez Beach, it is a self catering summer holiday house nestled amongst the cool green mandarin gardens approached through a dry river bed on one the last preserved areas of the Bodrum Peninsula. Completely remodeled in 2002 from a small rural barn into a delightful holiday home by the owners Banu and Huseyin, the Cottage is a tranquil delight for those wishing to holiday in peace with nature, yet enjoy the great selection of restaurants and shops dotted along the seafront promenade. This private self catering accommodation features an up-to-date kitchen including a washing machine and large fridge/freezer; and the modern, western style bathroom has electric heated hot water 24hrs a day. There is a large terrace overlooking the rambling garden with its beautiful lawn, fruit trees and swimming pool, and is the perfect place to enjoy morning coffee or evening drinks. The Cottage bedroom features a large double bed, and the sitting room features one large and one smaller couch that may be used as additional beds, sleeping up to 3 adults or a couple with 2 small children. Thirty metres away from the cottage, nestled amongst the gardens and fruit trees, you will find the new Garden Cabana luxury tent, complete with double bed, mini kitchenette, mini fridge, and even a WC and outside shower! The Cabana allows room for two more (available at an extra cost), enabling larger families or two couples to enjoy the peaceful surroundings of this gorgeous little Cottage. 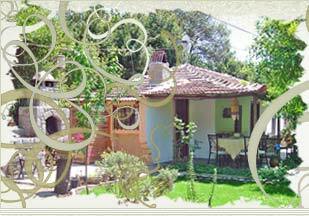 Bodrum Garden Cottage is private self catering accommodation amidst the mandarin and lemon groves. Relax and Indulge your senses in the hammock by the private pool. The dining area overlooking the huge rambling garden with it's mass of wild flowers, mandarin and fruit trees.